Have you ever made your decision for abroad? What is your choice of destination to enhance your quality of living? If you have not made any decision, consider Canada, because it is one of the most popular country providing attractive opportunities and benefits. And, if you have already made your decision, then you can compare and figure out the best decision. Canada is one of the promising nation providing a range of opportunities to skilled candidates. The Canadian Permanent Residency is the best platform to earn several advantageous benefits for living. The skilled candidates who are planning to serve as Canada Permanent Resident need to get their application launched through the Express Entry. The Federal Express Entry system is an electronic process which helps the interested candidates to meet the eligibility and gain the status of Permanent Residents. What is a Canada Express Entry? Canada Express Entry is a points-based system introduced by the government of Canada to trace out the issues observed during the previous immigration system. Since, it is a points-based, it needs a minimum of 67 points for eligibility. These points are calculated by considering the core human factors: age, education, work experience, adaptability and language proficiency. After considering the core human factors, candidates receive a Comprehensive Ranking System (CRS) score. The Candidates can now choose their suitable economic program for Permanent Residency from the Federal Skilled Worker Class (FSW), the Federal Skilled Trade Class (FST), the Canadian Experience Class (CEC) and Provincial Nominee Programs (PNP). What are the eligibility factors for Canadian Permanent Residency? It is very important for an interested candidate to avail a minimum 67 points for eligibility. 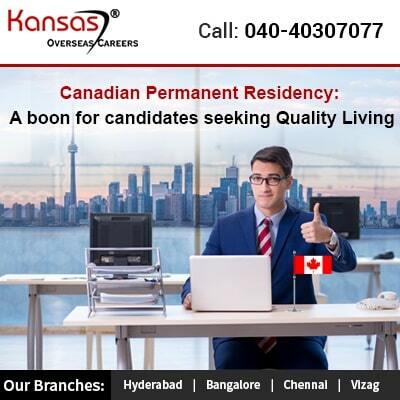 More the points, the more the chances to avail a Canada Permanent Residency faster. Hence, it is crucial that candidates have a good knowledge on the factors. What are the benefits with Canada PR status? How to calculate my eligibility score? Since, the system involves many questionnaire, it is better to choose for a visa consultant for a simplified immigration process. Also, this way can help the interested candidates to get a better understanding of Canada immigration and Express Entry System. Kansas Overseas Careers is one of the successful visa consultant providing best visa assistance from expert Canada Visa consultants. To know more, call @ 040-40307077 or fill the free visa assessment form.